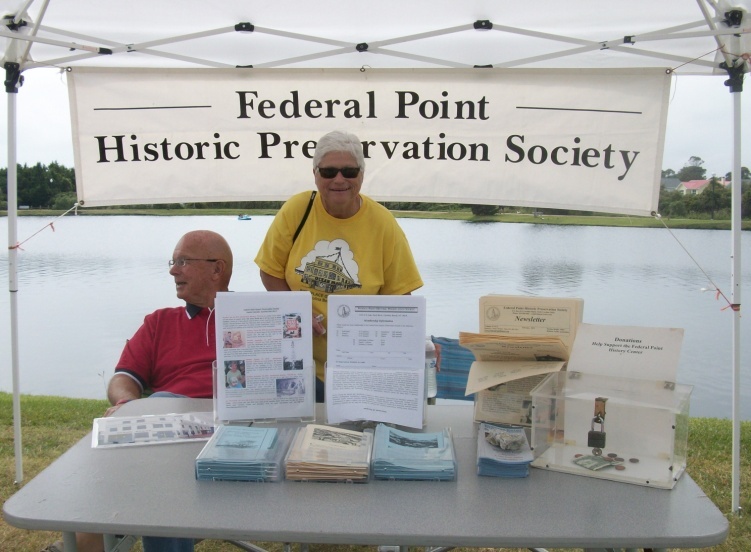 The Federal Point Historic Preservation Society held its monthly meeting on Monday, September 17, 2012 @ 7:30 pm at the Federal Point History Center, 1121-A North Lake Park Blvd., adjacent to Carolina Beach Town Hall. 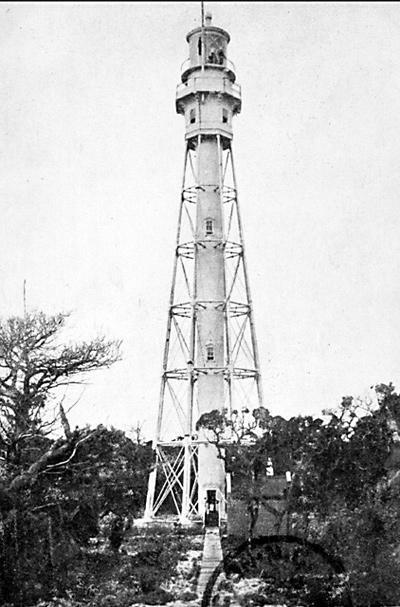 From 1903-1958 the Cape Fear Lighthouse stood guard over Frying Pan Shoals from the SE corner of Bald Head Island. But with the opening of the Oak Island Lighthouse it was deemed obsolete and blown up. Sometime after the light was destroyed it’s first order Fresnel Lens ended up in front of an antiques shop in Wilmington where the individual prisms were sold to tourists passing by. A few years ago members of the Old Baldy Foundation “found” it and negotiated the purchase of the frame and the few prisms that were left from the children of the original owner. Mary Beth Springmeier, Executive Director, Chris Webb, President, and Kim Gottshall, Chair of the Lens Restoration Committee of the Old Baldy Foundation visited us from Bald Head Island to tell us the story of how they are bringing the prisms back to the Island, and how we can help. [3/21/2016 – We are saddened to hear of the death of Margaret Page]. Earl N. Page, Jr., was born in Atlanta, April 26, 1924. Earl had been coming to Fort Fisher in the summertime ever since he was knee-high to a duck to see Granny and Granddaddy (W. O. Page). His father’s parents lived in Wilmington on a street named for them off Wrightsville Ave.
Earl came out of the Navy after World War II in April of ’46 with almost 4 years service. He was on a 30-day leave just back from Nagasaki, Japan when they dropped the bomb. 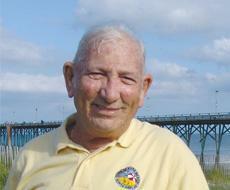 Earl lived at Fort Fisher with his daddy and granddaddy. They ran the pier, about 8 cottages, and a restaurant. Outside restrooms and showers served fishermen and, every weekend, a lot of sightseers. Margaret Helms (Page) came to Wilmington because her daddy worked for Standard Oil. Her family bought three places at Wilmington Beach. Hurricane Hazel got 2 of them. Margaret’s roots were really in Wilmington but her momma and sister came down here all the time. Earl met Margaret in ’46 and they married in ’48. The couple lived right across from her Momma in Wilmington Beach in a barracks with electricity, phone, trash and sewer. They never heard of air conditioning. You just left your windows up! They didn’t have a TV but had a radio. Earl did fancy roller skating on Shipyard Blvd. where they used to go. They jitterbugged in the summertime at The Lumina at Wrightsville Beach and on the Boardwalk at the Ocean Plaza. One or two special dancers, mostly men, were good enough to be professionals. There’d be girls (just teenagers) waiting to dance with them. Each man could take the girl across his shoulder and turn her every way but loose. You put the nickel in the jukebox and you’re dancing. You get your money’s worth. Then the shag came in which Pages didn’t care for. Nearby Sea Breeze had some of the best live bands – Count Basie and many others. You could hear them right in the boat Basin. People would go up there and anchor just to hear em. A good Southern breakfast – grits, seven days a week, scrambled eggs, coffee, and ham, sausage or bacon. Margaret rolled her own biscuits. Been doing it 58 years. If you start off with a good breakfast, you’ll do good. Dinner was a meat (chicken or steak), a vegetable, a starch, and of course, a dessert. Earl could eat fish 7 days a week any day of the week, breakfast or supper. Margaret liked to prepare fish any way, just name it. Remember those big triangle bars that they rang at the farms? Lunch or dinner, you’d hear that ringing all down here in Kure Beach. 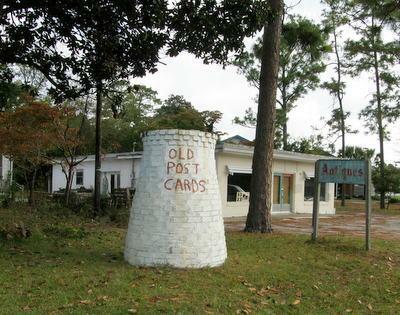 The Drugstore at Carolina Beach was where Laney Real Estate is now. 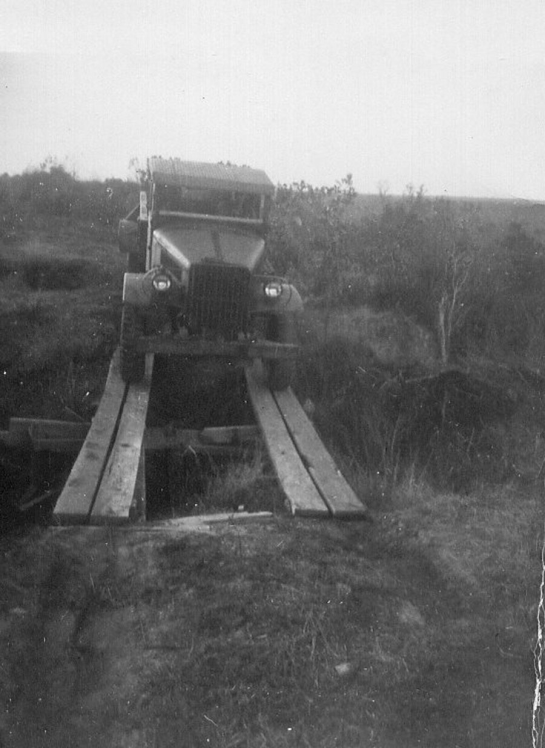 Earl did most of his truck service or took it into Wilmington to the International people just over the Northeast Bridge. Banking? Pages didn’t have money enough to go to the bank. Church was St. Paul’s Methodist. Bame Hardware had everything, but nothing like we know it today. Bame had a grocery store, a hotel, and right across the street was a Texaco Station. Miss High had the best restaurant, a diner and ex-street car converted into a diner, where Mack’s used to be. She did her own cooking,. Another one at Kure Beach on the way down to the pier was run by Ma and Pa Fry. All was good Southern cooking, not like fish houses. Groceries? At Carolina Beach a man came by every morning selling everything out of the garden farm somewhere in Masonboro just over the bridge. Earl’s Grandmother and all the other housewives knew when he was coming. 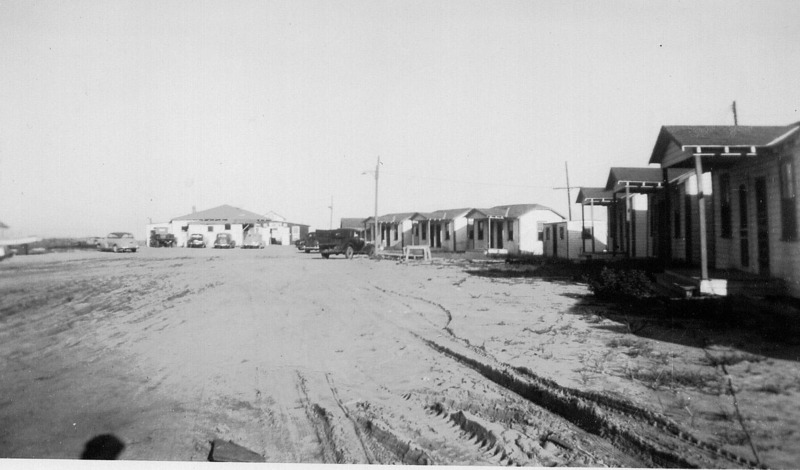 Edward Lewis had a grocery store and meat market at Kure Beach right across from Big Daddy’s, also a filling station back in those days where you got service and they wiped your windshield and looked at your radiator to see if you had enough water in it. The meat was handled by Jones. A Meat Market was where Linda’s Dress Shop is now. And right next door to him was Jessie Robertson’s Fish and Tackle Shop. The buildings are still there. Earl had a 52-foot shrimp boat to shrimp down where Snow’s Cut marina was, not the State Park. Linwood Lewis had a small shrimp dock off to the side of the marina. Earl sold fish to Lewis (Linwood) who would buy all he would catch. Earl would run over to Southport sometimes with his small motor boat when they were getting low on shrimp and get a hundred pounds at a time. Earl also sold fish to the Atlantic fish house on the waterway. Island Day: Sunday September 30th from 1-5. The event was held at the Carolina Beach Lake. Our booth was a great success and people appreciated Devin’s display. We even got a few donations. A huge thanks to Darlene and Leslie Bright, Demetria and Phil Sapinza, Cheri McNeill, Paul Slebodnik, Susan Foy, Rodney Jones, and Cindy Clark for their time to make this event a success. We’re also planing a Coffee/breakfast, and hot dogs and drinks sale for Saturday November 3 from 9-1. Four years ago, we just happened to be having a barbeque sale the last day of early voting and “made a killing.” Please consider volunteering to help out with this project. We will need people to “bake” cookies to sell as well as people to work the sale table. Mary Beth Springmeier, Executive Director, Chris Webb, President, and Kim Gottshall, Chair of the Lens Restoration Committee of the Old Baldy Foundation joined us to tell the fascinating history of the Cape Fear Lighthouse and it’s “lost” lens. 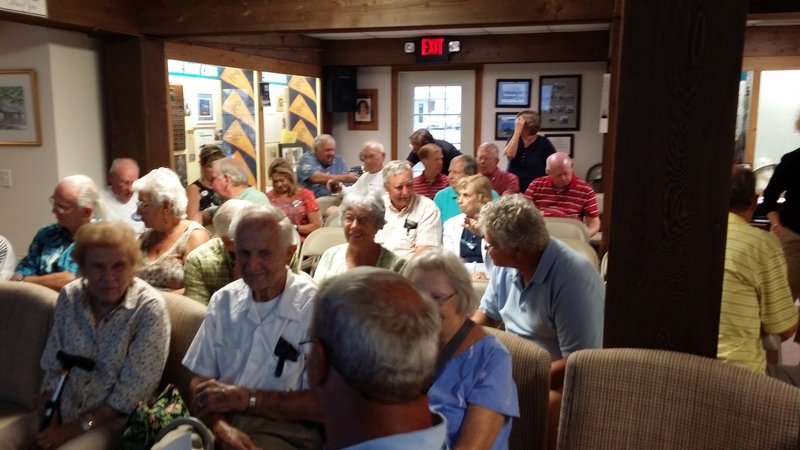 They told the story of how they are bringing the first order Fresnel lens prisms back to Bald Head Island, and asked us to help “get the word out” to old timers who might have bought one from Labriolas Antique Shop on Oleander Dr.